Bob Rodriguez, Partner and Chief Executive Officer of First Pacific Advisors, delivered the keynote address the end of last week at the Morningstar Investment Management Conference. 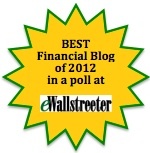 Mr. Rodriguez is a 35 year veteran in the financial industry and a Morningstar Manager of the Year three times. In my humble opinion, there are none better in the industry today. As I referenced on NQR’s Sense on Cents with Larry Doyle last evening, I totally concur and feel strongly about Mr. Rodriguez’s powerful pearls of wisdom. I beseech you to read this address, save it, read it again, and share it with your colleagues! Allow me to comment and highlight Mr. Rodriguez’s major focal points. Mr. Rodriguez addresses every major issue in our financial world today. He layers those issues on top of the potential social impact our country faces. Mr. Rodriguez is not bashful in highlighting that our day of reckoning is upon us. I have read this piece three different times. I am more impressed and in greater agreement with his assertions after each reading. 4. he talks about how and why he has made a major shift into energy stocks within his fund!! 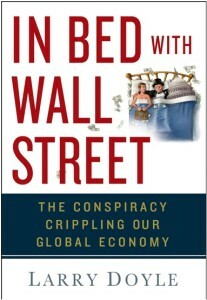 5. the changing nature of the markets and the global economies. 9. he addresses the horrendous business practices being promoted by GMAC. 10. the positive economic impact of the Stimulus will be offset by ongoing reduction in consumer spending. — the bulk of the economy’s credit problems are still to come as charge-offs on trillions of dollars in loans remain to be recognized. 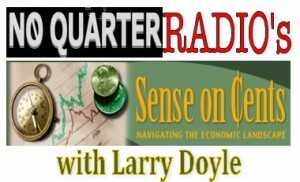 In observance of Memorial Day weekend, NQR’s Sense on Cents with Larry Doyle will not be broadcast this evening. 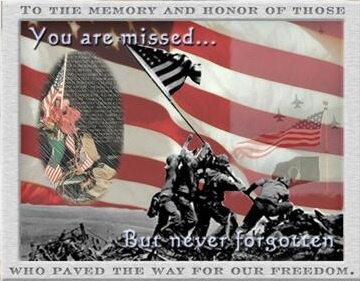 I hope you are able to enjoy the holiday with family and friends while reflecting on the people and values Memorial Day celebrates. We are currently living through historic times, but we can never afford to forget the sacrifices of the special men and women who fought for our freedoms. God bless them. Even though I will not be broadcasting this evening, if there are any questions or topics you’d like me to address, please do not hesitate to ask.